I see why Kamagong, great stag, great patina on a great blade. Scott, like the cord weave, how many feet long is one like that? Cool. After getting my 21st GEC , a Che Chin Rosewood 64 , I'm finally carrying one. I always figured they were too nice to use. This is now my EDC back pocket knife. I got a stag one too to keep under glass. Very nice line up, don! Which one is your favorite? I have a question...I'm wondering why the polished blades seen to be in better shape than the satin finished ? Both knives were used pretty much the same way, every day chores home and work, got wet and forgot about for a while... ...been using them for 4 to 5 years. Clean them in hot water and dry off, sometimes a little oil on the blades. As a matter of fact yes my EDC is in fact a GEC 85P. Same old 2014 Viper, but new bead and thong. Probably my favorite GEC EDC. WelderBob wrote: I have a question...I'm wondering why the polished blades seen to be in better shape than the satin finished ? Some where I have read that the slicker the finish the slower that rust forms. I guess the lowest places are holding material that promotes rust. Just my opinion, but it makes sense to me. Thanks' Bill, That makes sense, I'm breaking in a few more so I'll see how these fair. I've been pocketing a few others but keep going back to this one to carry. I like the smooth and easy pull and solid lock up when opened, plus I just flat out love the look of the African Blackwood against the silver bolster and shield. sunknife wrote: I've been pocketing a few others but keep going back to this one to carry. I like the smooth and easy pull and solid lock up when opened, plus I just flat out love the look of the African Blackwood against the silver bolster and shield. That is a sweet knife I have never had a wood scale knife, so i just ordered the 13 Clerk with Gabon Ebony scales. It should be here Friday. Today I'll use this combo. I bet that #13 will look good in ebony and will feel good in the hand too, be sure to post some pics. 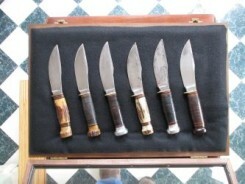 I love my bone and stag knives but the wood scaled ones do seem warmer to the touch to me. Of course that didn't keep me from packing a jig bone knife along with the wood one to work today.